I was listening to a radio documentary earlier this week which questioned the current structures of the United Nations. Particularly whether the permanent members of the Security Council were still appropriate and whether their veto should be continued. As a student of history, these struck me as having some similarities to the claims of irrelevance raised against the League of Nations formed nearly a century ago in January 1920. The commentators saw the UN as a huge step forward. An argument was made that the demise of the League was inevitable given the horror of the Great War and the natural renewal that comes with a new century. That last comment certainly made me think. Was there any evidence of a natural drive for renewal that comes with a new century? A quick scan of the academic research didn’t reveal much other than some passing comment about the new millennium prompting a reevaluation of the status quo be that personal, political or national identity. It is certainly non contentious to suggest that a New Year brings an urge for self-improvement and making a fresh start for many. Could something similar happen for a national psyche? Interestingly, when I started to look at when major constitutional or structural political changes were made in the past many do seem to cluster around the first twenty years of a new century. Between 1700 and 1720 there were major political reorganisations with the Act of Union (Scotland), the Act of Settlement in the UK and Europe again split over the Spanish Succession. Finally in the 2oth century the first twenty years of the century were marked by the Boer War, the Boxer rebellion, the Russian revolution, the direct election of the US Senate and the extension of voting rights to women in the US. Plus there was the little matter of the First World War. This concentration of political and social change at the start of each century may be purely random or the result of optimistic zeal for major reform brought about by the change of century. I will leave that to someone else’s thesis, but it is an intriguing correlation. It may also account for the growing political dissatisfaction currently being expressed across the political spectrum. Some see it as the demise of dominance of the liberal and political elites (whatever they might be). Others see a growing voice of both the under classes and the ‘silent majorities’ or forgotten voters.Whatever the truth, 2017 looks like being a turbulent time as a perfect storm has the potential to brew over the next 12 months. Personally, I have never believed in or understood the argument that all is decided by a small liberal elite. It would be difficult where turnout in most liberal democracies are as high as they are. Also, if it were the case then I doubt we would have President Elect Trump, Brexit or many similarly unexpected results. It’s just as likely that these unexpected results reflect an increasingly politically aware electorate. If that is the case then surely that should be something to be welcomed? It appears many voters no longer rely on the press to call elections in advance, nor do they engage with polling organisations other than on their own terms. Shy Conservatives, embarrassed Brexitiers, Timid Trumpers, covert Corbineisters and guilty UKIPpers can all be explained by people deciding their vote is their business and not disclosing it to the polling organisations and media. If that is the case, then some of the electorate are becoming more politically savvy than those organisations. Most recently, there has been increasing dissatisfaction with the fact that Donald Trump has won the US Presidential election without having won the popular vote in the country. Whilst votes are still being counted it certainly looks like Hilary Clinton will have polled around 2 million more votes than Donald Trump. However, that’s neither new nor in my view is it he point. Some American commentators take the view that this was exactly the system the Founders had in mind. They contend that pure democracies don’t work and the popular vote is secondary to ensuring the support of most States. There already have been four (possibly five) US presidents who gained power whilst losing the popular vote. These being John Adams (1824), Rutherford Hayes (1876), Benjamin Harrison (1888) and George W Bush (2000). The questionable result being John F Kennedy in 1960 which is probably too close to call given some electoral idiosyncracies in Alabama at the time which are probably impossible to unpick today. All electoral systems have idiosyncracies in their structure which cause oddities in their respective results. To criticise Donald Trump for focusing on the States which gave him the maximum votes in the electoral college is just bizarre. You may as well criticise British politicians (or Australian ones come to that) for focusing most effort on the marginal seats in play rather than working with equal effort on safe seats. – Politicians are merely exploiting the rules of the system under which they get elected. It has been argued that recent electoral results have been abhorrent. However, it can also been seen as a massive protest vote against the current political status quo (informed or uninformed as the case may be). If this is the case then regardless of your political positions all mainstream parties can be seen as having failed their electorates by morphing towards a homogenous middle ground populist position. Against this background only the outspoken, colourful, political outsider (or as my better half would say ‘the batshit insane’) stand out. Could this explain the sudden popularity of the ‘non-politician’? Trump has been elected to the most powerful office of State with no previous political experience. Forage in the UK championed a strongly Euro-skeptic position was considered as a political outsider prior to the Brexit vote. Similarly, more extreme politicians such as Marine La Penn in France are becoming more popular whilst local dynastic figures are repeatedly rejected (e.g. Clintons in the US, Sarkozy in France). Regardless of your position within the political spectrum this makes 2017 one of the most turbulent and potentially dangerous years in recent times. The BBC’s Andrew Neil recently visited the US to cover the elections and is on record as having spoken at length with Trump’s team. He reports that not only is Trump supportive of the UK decision but is willing to actively pressure Europe not to ‘beat up’ on the UK for leaving the club. Why might he do that? Neil and others formed the view that he was the first US President in many years to be anti EU. Not necessarily anti European nation States but seeing little value in the overarching political structure of the Union. With the apparent demise of TTIP (the US/EU trade agreement) and Trump’s dislike of multilateral agreements this could mean the least meaningful contact with the EU at a time when it faces the most internal division. If Trump’s view prevails with bilateral trade agreements out of the question for those remaining in the EU (at this time), then the UK suddenly looks like the only game in town within continental Europe. Whilst this may be better than expected news for those interested in Brexit it may not provide much in the way of comfort to Europe for the coming year. Whilst I should declare I was one of those wishing to leave the EU, and don’t regret my vote, I have no wish to see Europe fractured, although ultimately any institutions must be fit for purpose. Pollett was making his view based on all other things being equal – however, the evidence suggests other things are also loaded against the union in it’s current form. Italy’s Five Star political movement is taking every opportunity to press for a referendum re the continued use of the Euro within the country. Whilst the EU may be able to continue without the UK, it is doubtful that the Euro would be able to continue without Italy. With unrelated constitutional agreements pending in Italy some have questioned whether the Prime Minister can survive if the popular vote continues the current popular trend. In which case, the referendum may be the price of continued political support. Whilst the Euro crisis in Greece is considered over by many, warnings are already coming out of Greece and Germany that a fourth and even fifth bail out of the Greek economy may be necessary and should not be written off as fanciful or scaremongering. If you think Brexit was a disaster, just consider the emerging fault lines at the centre of the European partnership. Similarly, the German Chancellor is taking actions that would have been unthinkable just a few months ago. It is widely understood that there is friction between Germany and the EU Commission following Mr Junker telling Mrs Merkel to keep her industrialists in check and not to allow them to give the UK an easy time in Brexit negotiations. Regardless of your position re Brexit, can it be healthy for an unelected bureaucrat to be advising an elected head of Government how her country should conduct themselves? Ultimately, most politicians will consider their own electoral position first. Perhaps this explains the Chancellor’s recent request of the EU to clarify the exact meaning and constraints of ‘free movement of people’ within the existing Treaties. My suspicion is this has more to do with the possible success of Madam Le Pen in France in the coming Presidential elections. Combined with these structural pressures and displeasure is growing following the EU ignoring the outcome of a Dutch referendum re visa restrictions. Similarly, Switzerland is entering extended discussions with the EU after being warned their recent vote to curb cross border working breached EU regulations. Interesting given that Switzerland is not a member of the EU. Personally I remain content with my Btexit vote. Equally, I grow increasingly disappointed at the EU (rather than Europe) being unable to listen to growing disquiet from its members. In France, Le Pen who now looks a possible winner in the French presidential elections is committed to a French exit referendum. If Brexit seems a body blow, how would Frexit do anything other than lead to the fracturing of the Union? Similarly, the Northern League in Italy is already calling for the Italian equivalent in that country. In the Netherlands, Geert Wilders has made continued EU membership a key part of their next general election campaign championing the need to renegotiate or leave. Recent polls in the Netherlands show an average of 88% in favour of a UK in/out vote. Swedish MEP Peter Lungdren recently stated ‘The unspoken truth is that Denmark and Sweden are already on the brink of leaving. A Nordic trading bloc including the UK looks a viable alternative’. Already a little reported referendum in 2015 has prevented Denmark from handing over further powers to Brussels. Interestingly, the Commission has already stated this has fallen into the same category of ‘to be ignored’ as the recent Dutch referendum on visa controls. If this disregard for the view of the electorate(s) is the outcome of the current status quo, is there any surprise that people have stopped engaging? It may be worth pointing out that many of these difficulties stem from the desire to protect the four fundamental freedoms of the EU. These are said to be indivisible. However, if this is the case, perhaps someone can explain why there are currently internal border controls in operation in Austria, Denmark, France, Germany, Norway, Poland and Sweden. In what looks like an increasingly fractured Europe with America’s attention focusing elsewhere, the next area under debate looks set to be defense. As recently as last week (BBC This Week) former defense secretary Michael Portillo said most of Europe has been living in cloud cuckoo land over defence since the 1980’s.He held that they fail to recognise the importance of the US Umbrella to European defence, want a Europe free of American forces but also increasingly fail to meet their existing NATO commitments. President Elect Trump has already pledged to build the Pacific fleet up to 350 ships to bolster the perceived threat of instability in that region. This is at the same time as saying spending on NATO is out of proportion and not his top priority. I certainly don’t seek to justify the spending levels of the US defense budget, it is clear that the next biggest spend is currently from China. Whilst much of the noise from Trump tower may be bluster, it’s hard to see him having much sympathy with Europe asking for more support when the majority of it’s members don’t meet their current 2% contribution. Even if a significant element is for public consumption, not even the US could afford to make such an investment whilst maintaining its current expenditure on NATO. As Andrew Neil pointed out, it will also be hard in the absence of the US for the calls on the UK to be anything other than increased. A difficult message to ask the UK to put their forces on the line to support Europe at the same time it’s bureaucracy want to give us a kicking for leaving the club. Are we all separated by a common language? I’m sure I can’t be the only person who has annual landmarks that witness the passing of the year. For me, one has become the six nations rugby championships. As they draw to a close each year, I know that spring has arrived and lighter, longer days will soon be on their way. This year, as England try to achieve their first Grand Slam since 2003, it is perhaps appropriate (and entirely coincidental) that my first blog for some time should have a rugby connection. However, the inspiration originated far from the rugby field and has more to link it to Ireland or Australia than England, but accepting that, it still brought me back to blogging. Yesterday, my Australian partner posted an update on social media in which he said how annoyed he was to have lost his Irish rugby jersey, particularly given that it is Saint Patrick’s day and would therefore have been his clothing item of choice. Add to this comments made to me saying they were all wrong and it’s a shirt and I started to wonder just how divided we are by words to describe the same fairly innocuous item. So what exactly is this item (please note the carefully observed national neutrality). So far we have offerings of Jersey, Jumper, Shirt, Pull-over and wind-cheater. Perhaps more interestingly what drives these differences. Clearly nationality plays a part; I remember once asking someone to pass me my jumper in San Francisco – not a mistake I shall make twice. To save you getting some very dubious search results, I should point out that in American English a jumper is most commonly a sleeveless dress that’s made to be worn over a blouse or other top. That would make it both different to the ‘woolly pully’ I had been wearing and totally out of place on the rugby field. So I turned to a friend who has worked as a lexicographer since the 1990’s for some clarity. This comes with the caveat that it’s a British viewpoint and other linguistic branches may lead to different destinations. That said, wind-cheater is perhaps the easiest to exclude in the UK. Here, a wind-cheater is a comparatively new phrase and is a wind proof jacket with a tight fitting neck, waistband and cuffs. The rubgy ‘top’ has a tight fitting neck, waistband and cuffs but isn’t a jacket (has no closable opening the full length of the front) so that’s one down off the list. Similarly. pullover (although technically applicable can be excluded being a warm item of clothing usually woollen with long sleeves worn on the upper part of the body. It is pulled on over the head. However, it is typically social/leisure wear and not in a sporting context. Then, according to the lexicographers, it becomes trickier and linguistics needs to be supported with history and a spattering of inherited misnomers. So, jumper, jersey, or shirt? Here the history of rugby itself becomes relevant. In 1823, during a game of football at Rugby School in England, legend has it that 16 year old student William Webb Ellis, caught the ball and ran with it rather than following the rules of the times of catching and kicking the ball only leading to the birth of the game. However, it was too physical in an unregulated form for most being most popular with railway navvies who played it between working. It was 1871 before the first ‘kit’ was defined. You certainly wouldn’t recognise it today. The uniform was vest, normal white shirt with bow tie, trousers and stout walking boots. Although very different the generic term ‘rugby shirt’ stems from the very birth of the game and persists today. As sport developed in the early 2oth century the work shirt morphed into what we would now recognise as a cross between a grandad shirt and a vest. This rapidly became too light and cold for the newly formed game. Whilst the precise origin is unknown, these then changed to knitted long sleeved rugby tops thought to have come from the Channel Islands who spotted a potential market for their declining woollen industry. These became known as rugby ‘jerseys’ named after the style of the knit. – Interestingly, those remaining look more like guernsey’s but putting your guernsey on doesn’t sound quite right does it? However, all retained the formal collar style in a nod to the original formal shirts – something I’d never quite understood until researching the subject. The last piece of the jigsaw to consider when deciding on your preferred choice is snobbery and the class system. Whilst a jumper certainly fits the definition (a warm often woollen long sleeved item of clothing), the very type of schools that saw the birth of rugby were some of the places that took a strong dislike to the word. Why? Well there are two schools of thought. It could be that jumpers first became popular as a term in the 1850’s. Then they were derived from the french word joup which can best be described as an artist or workman’s smock. Alternatively, when these ‘jumpers’ became popular, they did so in the very working class northern mill towns, usually with a close association to the wool trade. Either way, certainly not what 19th century public schoolboys should aspire to be wearing. So in my most Dr Sheldon Cooper stylee, I have to discount wind-cheater and pull-over on the grounds of definitions. Jersey goes because it’s not a jersey, I might as well call it an Aran and down that road leads madness.Jumper would have been ok if it were woollen so I’ll go with the generic and historically consistent ‘shirt’. Others are of course welcome to make their own choices. However, dipping my toe into this entomology shows me just how much we remain bound by nationality, class prejudice, regionality and history. So my thanks to Cynthia, Vaughan and Caroline for sparking my interest and to James for help with the lexicography. Isn’t language just fascinating? Syria: Substantive issue or sideshow? This week in the UK has seen an understandable focus on the Parliamentary debate concerning the bombing of ISIS/Islamic State/Daesh positions in Syria. The decision to commit UK air power as part of the international coalition followed a ten hour debate in the House of Commons and a free vote. MPs voted by 397 to 223 in favour of sending Tornado and Typhoon jets to seek out Isis targets in Syria. Less than an hour later, jets were scrambled from RAF Akrotiri in Cyprus bombing the Omar oilfield. Additional jets and support aircraft have been arriving during the course of the last 12 hours. Whatever your view on the outcome of the vote, the process must surely be an improvement on the run up to previous ‘wars’. In those cases (most notably Iraq), forces were committed by the Prime minister using prerogative powers. Having watched large portions of the debate, I was at least encouraged by the quality of some of the debate of both sides of the argument. At least decisions of this magnitude are being taken by the elected commons. That said, much has been made about the bombing of positions in Syria. I certainly don’t seek to reduce the significance of committing UK air power to another conflict. However, I am increasingly worried that this is just another step in a range of events which has remarkable similarities to the run up to global conflicts. As significant a step as the bombing of Syria by UK forces is, it may be worth putting the current coalition activities against ISIS in context against other conflicts. It doesn’t diminish the importance of the decision, but it does raise another question. In none of the other conflicts all of which had much heavier air force engagement were any won without significant ground forces being committed. The decision to send RAF planes to Syria can be seen as an almost inexorable progression towards ground forces being the next logical step. In that sense, this week’s decision is important but merely a precursor to a far greater commitment and escalation. Important as engaging in a new conflict is, I can’t help but see some wider similarities with a gradual reduction in civil liberties, labelling of minorities and increasingly blunt instruments being applied in the name of security. 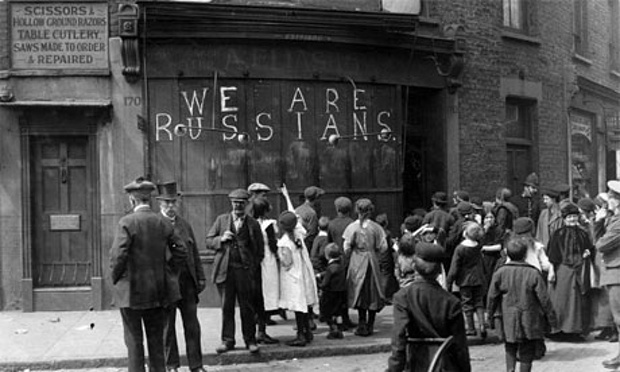 Looking at the first world war, there was an increasing reluctance in the UK to be seen as being of German descent. Thousands of families Anglicised their names to be seen as more socially acceptable. Perhaps the most notable being King George V. His proclamation of 1917 changing the House of Hanover and Saxe-Coburg Gotha to the House of Windsor. Worryingly, the first signs of Muslim families Anglicising their names was seen as early as 2002 following the attack on the twin towers. More recently the same phenomenon has been observed in Europe and Canada. In his recent book Muslims in Australia, author Nahid Kabir notes the same process happening in Australia. Of course, many other actions were taken against minorities in the run up to World War II. At least we don’t have those extreme measures being carried out – or do we? ‘C’ – ‘no security risk’, numbering around 64,000, who were left at liberty. More than 55,000 of category ‘C’ were recognised as refugees from Nazi oppression. The vast majority of these were Jewish. Although no such steps have been taken in the UK or elsewhere, there is a worrying trend emerging in some quarters. 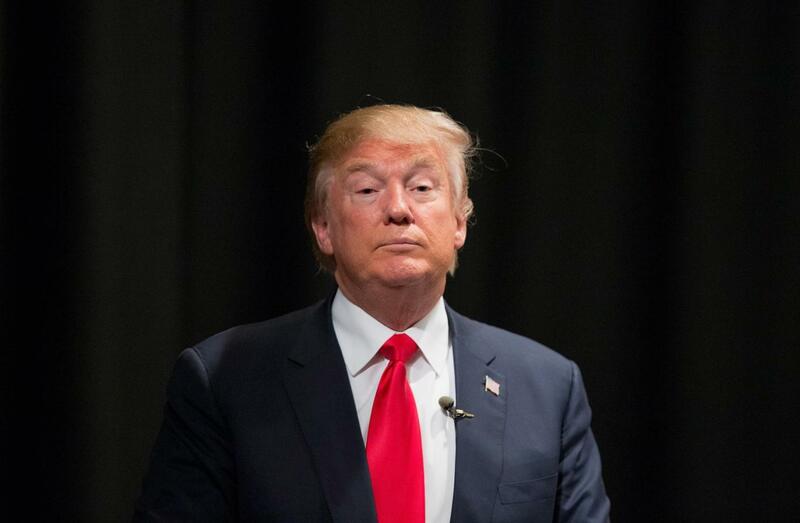 U.S. Republican Presidential Candidate Donald Trump recently called for a register of all Muslims resident in the United States to be created. The next step was the simplistic thinking from some in the first and second world wars that all Germans were a national security threat and should be excluded from Allied countries. Of course the views of one radical politician don’t indicate a groundswell of opinion. However, the fact that he feels confident enough to voice such thoughts is in itself telling. Some of the legislation being considered and passed in the UK and elsewhere has some worrying similarities with legislation of the late 1930’s. In the run up to World War II the Dutch Government required citizens to register their religion. Similarly, pre war Germany required leading non Christian leaders to register with the State. These laws and requirements were some of the first ‘impositions on personal liberties’ to be swept away in post war reconstruction and during the founding of the embryonic European project. Given this it is perhaps troubling that the UK Government is consulting on legislative changes requiring religious leaders of all nominations to register with the State. 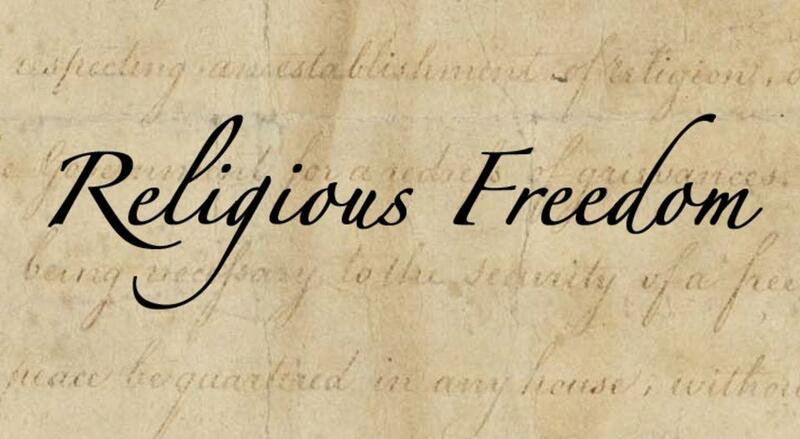 I certainly don’t seek to encourage or defend religious extremists of any creed, but I would be one of the first to defend anyone’s right to the freedom of religious belief (or lack thereof). Finally, a picture of a rally in Madrid reminded me of the actions taken by Russian and Polish immigrants in both World War I and II. Those families with Germanic sounding names often found their shops and premises subject to attacks and isolation. This became so problematic that many of the families wrote their nationality on their premises to avoid attack and victimisation. Whilst it appears these tactics were often successful it shows a deeply ingrained air of mistrust and suspicion which can have done nothing to build social cohesion and inclusion. None of these incidents in isolation mark an indication of immediate conflict. However, it does worry me that a number of these together show striking similarities with the descent to major conflicts of the past. I fear that steps taken this week will ultimately lead to ground forces being committed in the medium term. I have no idea whether it will make the people of the UK or elsewhere any safer. However, I fear this is merely the start of something far more complex. My hope is that we have learned some of the lessons of past global conflicts and we can recognise that ISIS doesn’t equate to Muslim and not all liberties are worth sacrificing in the name of security. 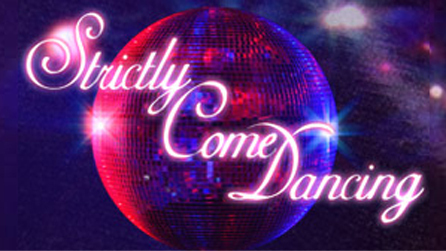 About ten years ago, the BBC made what could now be described as a brave and inspired move introducing Strictly Come Dancing to the UK. Replicated across the world, most famously as Dancing with the stars in the US, all were based on Come Dancing which ran on and off in the UK from 1949 to the late 1990’s. The original was noted for its amateur dancers and their tendency to sew on sequins to any possible item of clothing. The participants were highly skilled and experienced dancers albeit rather plastique at times. By the 1980’s it had a rather stayed, conservative and unexciting reputation which consigned it to a dwindling specialist audience until it was finally scrapped by the BBC in 1998. After a brief absence from our screens, a re-vamped version Strictly Come Dancing was introduced in 2004 becoming the must-see programme of that and subsequent autumn season viewing. the past few years to such a point that I had not followed or watched the 2015 series. The reasons for this are varied. It feels as though just about every ‘celebrity’ has been put thought the strictly ‘journey’. The inevitable churn of professional dancers means some favoured cast members have left and the focus of the show seems to have shifted in my view – in a way that made it less attractive. One of the reasons I became jaded with the series in recent years was the sense that some of the participants were using the series as a means of self-promotion. Clearly as ‘celebrities’ this will always be a consideration, but it appeared to have become the driving factor in some cases. Given that, it was perhaps no surprise to read the message on Mr Vine’s website. Firstly, I have no issue with Martin or his right to make such a comment – I just strongly disagree with it. In fact, I felt so strongly about it that I reviewed highlights of the series so far to see what could have led to these comments. After all, he isn’t the first contestant to be less naturally talented than his fellow competitors. What I saw (and I appreciate others may see something different) was a rather normal man enjoying to learn to dance and doing his best to progress in sort of dance competition. 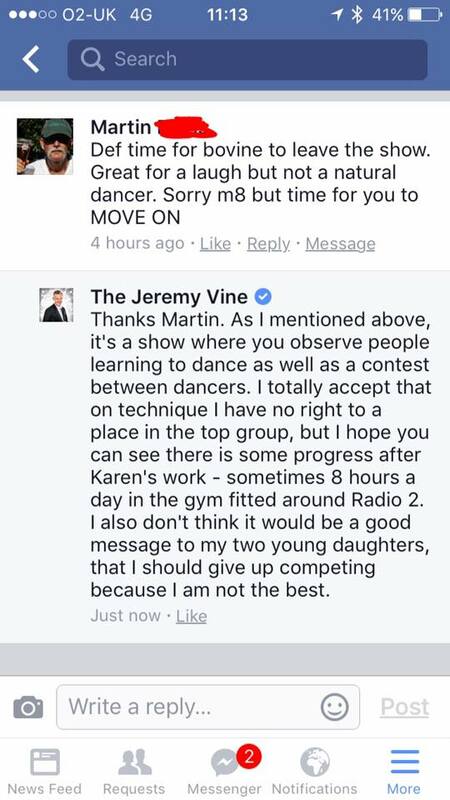 It may be true to say that Jeremy Vine isn’t as natural a dancer as some others in the series this year. However, I have to ask the question – so what ? In his response, Mr Vine explains how he doesn’t want to set a bad example to his daughters and reinforces the fact that he’s trying to do his best and improve as the weeks pass. For me setting a good example is certainly valid but ultimately a very personal matter. How sad it would be if we could only participate in things where we had natural talent. For me Jeremy Vine is giving of his best – whether that’s as good as others isn’t the point. He certainly isn’t the first to suffer from this phenomena, Julian Clary seemed to me to suffer some of the same in 2013. In fact, the rise of personality and ‘entertainment value’ over good old fashioned hard work and effort is one of the reasons I stopped following the series in mid 2014. I may mark both Julian Clary and Jeremy Vine lower than others in terms of technical capability, but very few put in more work rate than either and I thought (perhaps mistakenly) the show was also about learning a new skill. What a great role model both men have been to men of a certain age to take on new challenges and conquer them. More power to your elbow Jeremy. Without singling out any previous competitors it is clear that Vine is taking things seriously – or more accurately not playing the routine for mere impact or comedic value. When competitors start to be airlifted in to the start of their routines or using stunts and gimmicks they lose so much in my eyes. Whilst it’s true there must be an entertainment value, for me it shouldn’t overwhelm the dance element. It would have been easy to venture into this space but to his credit Jeremy Vine and his coach have consistently resisted this. 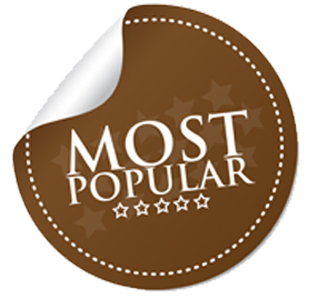 Ultimately, one of my strongest reservations about the most recent series is the tendency for all things to come down to a popularity contest among the competitors. Any one of these perceived negatives might be a reason to stop participating (or not start in the first place) in the series. However, just because you’re not seen as the world’s best at anything doesn’t seem to me to be a good reason to stop. I doubt I will be restarting the series for the reasons already stated, but I really hope those taking part don’t believe the hype – after all the audience is just that. Enjoy the skills you’re learning and don’t worry too much about the views of the armchair waltzers. Are we all going the way of the knocker-uppers? As someone who has spent some time researching my family history, I remember the surprise when I found a distant relative of mine had been a dog-whipper in the mid 1700’s. 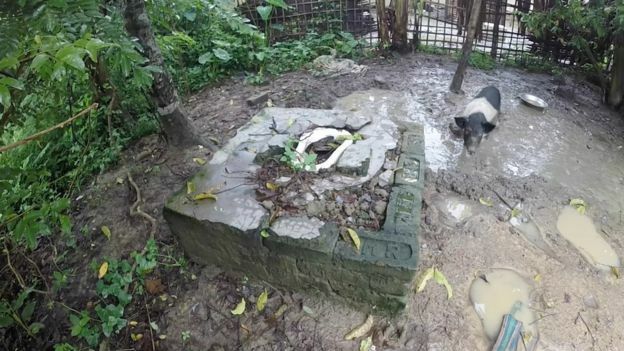 As an avid dog lover this was something of a horrific finding. In fact, after a little research although not wonderful, I found that this late in century there was no longer any whipping involved. In fact, this job was a type of church-warden who’s role was to chase off (or in extremis remove) dogs during church services. Historically, it had not been uncommon for dogs to accompany their owners to church, often with interesting consequences. The preferred tools of the trade were actually a large pair of wooden tongs often padded with leather pads or netting with which to remove the errant hounds. 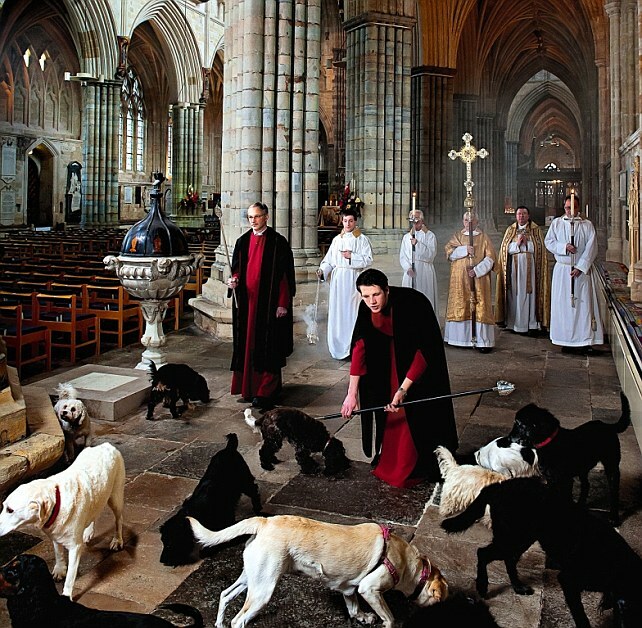 The dog whippers had disappeared shortly afterwards as it became socially unacceptable to take dogs into churches. Searching through census returns of the last hundred years it started to become something of a side interest when I found a particularly interesting occupation. The most likely reason for the disappearance of occupations before the industrial revolution was a change in social convention. However, after the industrial revolution the introduction of technology takes over and makes roles which were once considered indispensable redundant. One of the more common roles was the lamplighter who wandered the streets of 19th century towns lighting and extinguishing the gas lamps of the time. 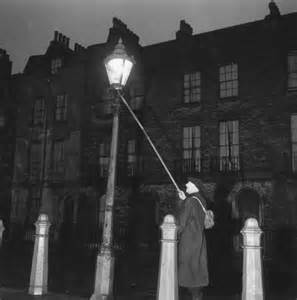 It was seen as one of the more secure semi-skilled jobs of the time – after all what could replace gas lights. When automated town gas and early electric lighting emerged, this didn’t stop the occupation from disappearing in little over 10 years. This then brings us to the deliciously named knocker-uppers who were key to the maintenance of an effective workforce until well into the Victorian era. Shared houses held several families, clocks and watches cost the equivalent of several weeks wages and those late for work were simply replaced by willing replacements queuing for work at factory offices. Given that, for our Victorian forebears, having a reliable timepiece could provide one of the most lucrative if antisocial jobs of the time. Charging each household a weekly fee of between a farthing and sixpence, the household could ensure that they would be woken (or knocked) up in time for them to start work. 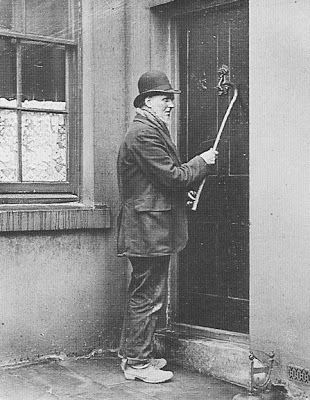 Some contemporary authors indicate that the knocker-upper was often paid second only to the landlord. Without turning up on time the likelihood of the workhouse or penury increased beyond measure. This role continued to be vital until the introduction of factory clocks and systems such as steam whistles indicating the start of the working day. However, the demise of this job is perhaps the most sudden with the role disappearing entirely within a period of three to five years. Of course, those with skilled occupations have managed to fight off the rise of technology for longer. 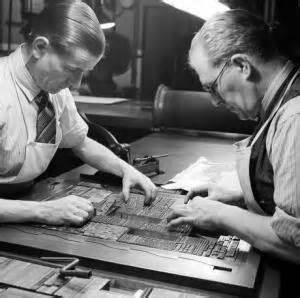 The dexterity, attention to detail speed and ability to work in reversed text had made the typesetter a skilled occupation from Tudor times until well into the 1980’s. However, this has changed with the growth of computerised technology, mobile working and the introduction of laser and thermal printing. These developments have seen the typesetter consigned to the list of historic occupations. It was perhaps the earliest example of technology moving into and replacing skilled workers. Despite these advances, the rise of technology was typically limited to replacement technologies or the introduction of computer processing making many administrative roles redundant. Until recent years, it was more uncommon to see more complex functions replaced. That may soon change with a new range of robotics making new inroads into areas previously very much the domain of a human workforce. Now, robots are making significant inroads into the workplace, again following the same pattern with less skilled work. Farmhands, milkers, stockmen and cattle herders are being replaced across the United States and Europe. Cattle no longer graze in fields with scheduled milking times but instead attend a robotic milking parlour when they want food. 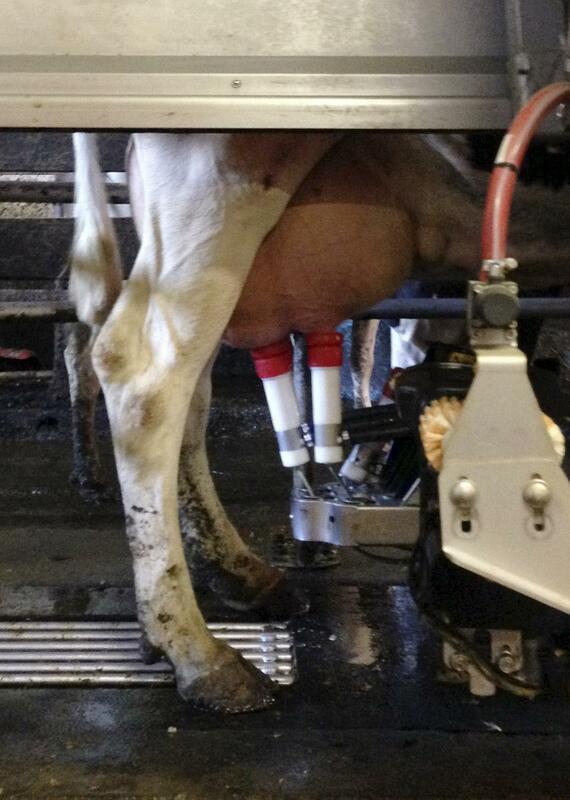 On arrival a robotic milking arm identifies the specific cow, scans the udder to ensure the optimum milking technique for the particular animal. It then applies a milking cup and orders food for the cow to be dispensed. Meanwhile a second robot monitors the feed ensuring waste is reduced by sweeping feed back towards the cattle and dispensing food only to the bays where cattle are waiting. Whilst farmers report up to 30% increase in yield these advances have been far from universally popular. Concerns over the welfare of grazing animals being permanently ‘housed’ and significant reductions in workforce make this an innovation feared by many. The parlour can replace a team of 5-6 herdsmen with a single ipod or tablet control. With increasing amounts of retail transactions completed online we have already seen retail jobs reducing as large warehouses servicing internet orders increasingly take their place. Even here, human interaction is becoming entirely optional. 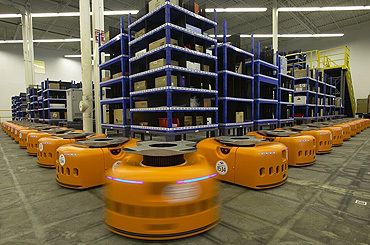 The new Amazon warehousing systems have replaced significant numbers of fork lift drivers, warehouse workers, packers and dispatchers. Automated pallet, storage and picking robots ensure that goods are picked within seconds of an order having been placed. It even has hidden impacts such as the fact that fewer safety/health and safety officers are required as the warehouse spaces have effectively become human free zones reducing the opportunity for injury significantly. Now, using similar technology, the robots are starting to breach the semi-skilled and skilled environments. 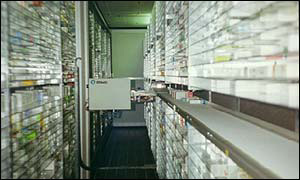 Hospitals are now reducing the number of pharmacists as medicine storage, replenishment, distribution and delivery are run via a fully robotic pharmacy. Two new build hospitals in the United Kingdom also have an underground level with robotic porters. Guided beds are integrated with the door and lift controls and the underground level allows access across the entire hospital site. The question for most of us remains, how liable is my job or occupation to be overtaken by automation. Of course in the past this would have been something a consultant or business analyst may have helped you assess. Now, the groundwork has been done and published on the web. (Another role bites the dust). In recent years the questions being asked were around what we would do with all the spare time automation would give us. Now, it seems to me that we are more likely to be asking what on earth will people still be employed to do? Other than those selling or servicing robotic workforces, there is also the question of how we will earn money to buy whatever is being mechanically produced, sold and distributed. It’s a shame robots don’t need knocker-uppers ! 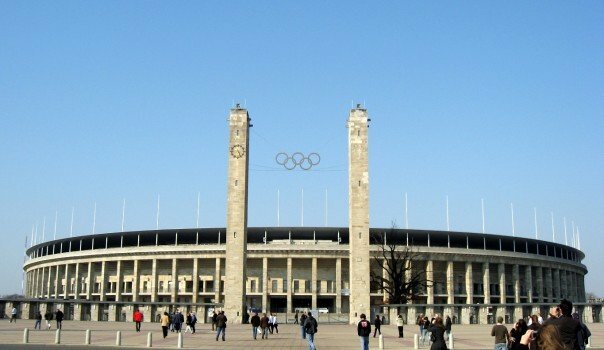 Does Germany still have a ‘special responsibility’? This last weekend saw my fourth visit to Berlin over the past two years. Although I had previously been to the city a couple of times pre-unification, these had been more ‘passing through with work’. It has only been over the last four visits that I have really come to like the city in a similar way to my existing love of Paris. 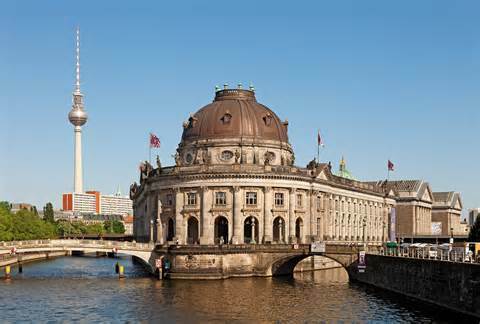 However, it is certainly my view that Berlin has changed quite noticeably in those visits. This weekend, I became aware of a strong and growing social resentment. At the risk of falling into a Fawlty Towers cliché, this is, in my view related to Germany’s psyche and specifically its continued sensitivities about its wartime history. If you visit Berlin, the city carries these scars quite obviously. The Jewish memorial is justifiably prominent, deeply moving and thought provoking. However, arguably, it has become the singular physical representation of the nations consciousness. There is an emotional and sometimes a physical blanking out of the war years. The equally striking and emotionally charged Russian war memorial is comparatively unknown. If you are lucky enough to visit the revamped 1930’s Olympic stadium you will notice the almost Egyptian chiselling of historic symbols from the fabric of the building. Hardly surprising as nobody least of all me would want to see Swastikas retained for historic integrity. However, this has served as a strong symbol reflecting the ongoing sensitivities. Within the rebuilt German Parliament, you will read a brief summary of the war years and an explanation that this history gives Germany a ‘special responsibility’ towards minorities and victims of religious or political persecution. This can appear to a non German national who wasn’t alive during the war to be over-compensation. Nobody would equate modern Germany with the days of the Nazi regime. Few consider the German people responsible for the actions of its political ruling class at the time. I have certainly seen nothing but a progressive, friendly, open and very welcoming country. I believe the rest of the world has come to terms with the actions of 1940’s Germany – I for one would like Germany to do the same. The current mass migrations from Syria led to a reiteration of this special responsibility with an open door policy announced for any Syrian refugees. It was notable on the day before I left that the definition of refugee in German media was becoming an issue. Should it be limited to the UN or legal definitions or more broadly move to what others would refer to as economic migrants. I hasten to say that I have great sympathy and an natural impulse to accept genuine refugees (those with a genuine fear of loss of life/persecution). The current position with mass migrations across Europe is an appalling one, however, does that make all concerned refugees? The knee-jerk instinctive reaction from German political leaders means these questions were simply not addressed. This weekend, in Berlin, I was amazed at what appeared to be a vault face based on atypical political naivety. In an amazing demonstration of surprise, Germany changed it’s approach on border controls stating it was surprised at the number of refugees arriving. Munich was reported by the German press as failing to cope with 30,000 people having arrived in 2 days. I wonder what was expected when you effectively announce an open door policy? Whether you agree with the policy or not, surely you can and should hardly be surprised when people offered a place in Germany head to Germany. More worryingly, I detected a change in tone among the German public (at least those reported in the press and in the café society of Berlin. 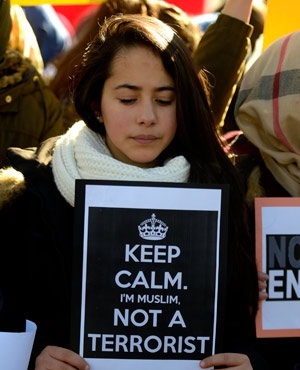 Demonstrators took to the streets in Freital, Germany demonstrating against the provision of accommodation being provided to refugees. It appeared this was a criticism of the unstructured nature of the governments policy. Whilst protestors accepted refugees and those seeking asylum they strongly resisted economic migration on such a scale. Alarmingly Rhabbi Barkhan, Director of one of Germany’s leading Jewish support charities spoke out publically about the concerns of the German Jewish community being able to accommodate and integrate upwards of 800,000 people with what they perceived to be a natural hostility towards them. 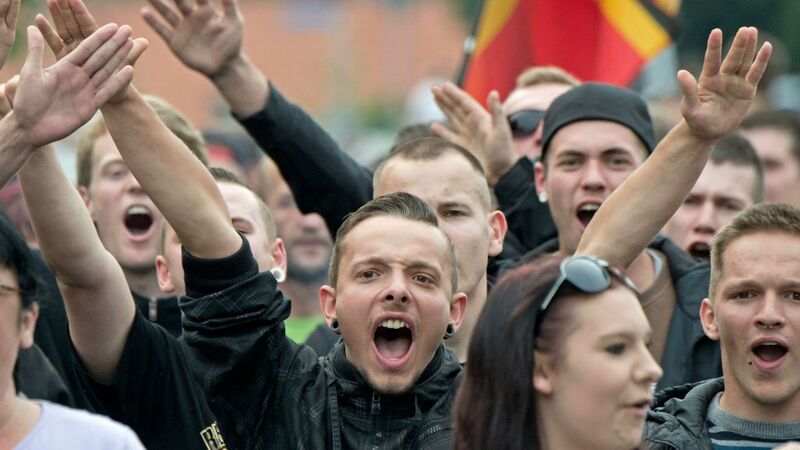 Whether or not you agree with these concerns, many in Germany clearly believe these internal frictions could have been avoided with a little more thought and reconsidering what Germany’s special responsibility means in the current climate. What I noticed during my most recent visit was the increased number of people sleeping rough on the streets. Many of the budget hotels were being used to home migrants without any obvious support or assistance to integrate or even understand their surroundings. When travelling back from an evening out in Berlin, I was amazed at the sea of bodies on either side of the river. Sheltering under boxes, blankets and plastic, these refugees whilst safer than in Syria had found a far less favourable Germany than they had anticipated. 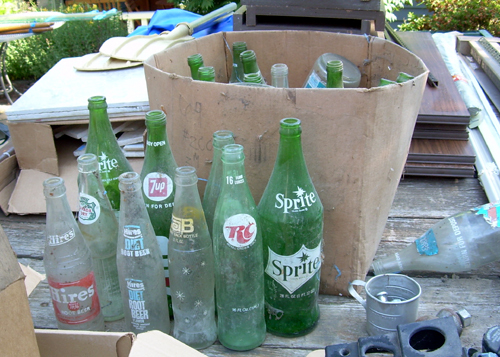 During the day, numerous migrants were collecting discarded bottles, cans and plastics to sell in order to support themselves. A few days after announcing a welcome to all, Germany had closed it’s borders, reinforced it’s most porous borders with the military and called on the rest of Europe to accept mandated immigration quotas to help support Germany’s special responsibility. As a visitor in Berlin, it didn’t look promising at this point. Following Hungary, Austria and Serbia announcing that they were not bound by Germany’s open door policy all border controls in those countries were strengthened. On my last day in Berlin, the news covered the border closures. A German couple at breakfast surprised me by saying ‘It won’t be long before they start shooting at them’. Prophetic words indeed. 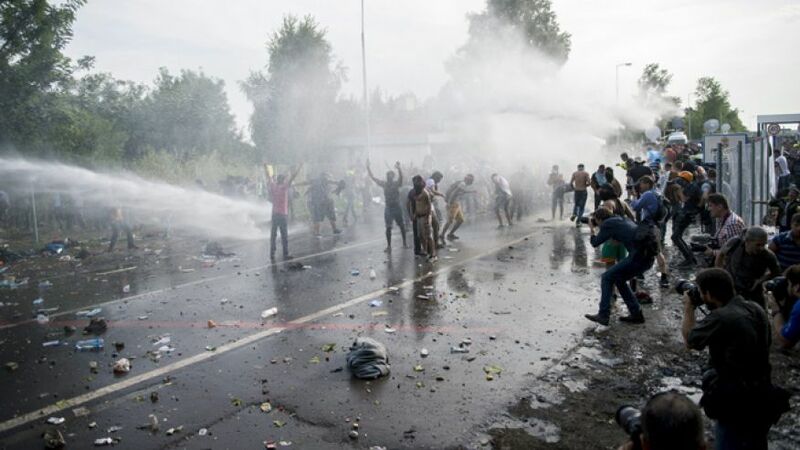 After landing back in the UK I remembered these words as Hungary deployed water cannon and CS spray to disperse those seeking to cross the border to Germany. So how much has a default and instinctive belief in a special responsibility helped those attempting to cross the continent. I for one am uncertain that it has done much to solve the underlying issues. I hope that Germany will reconsider it’s position. Seventy years after the end of World War II the special responsibility is no longer appropriate as a default position. 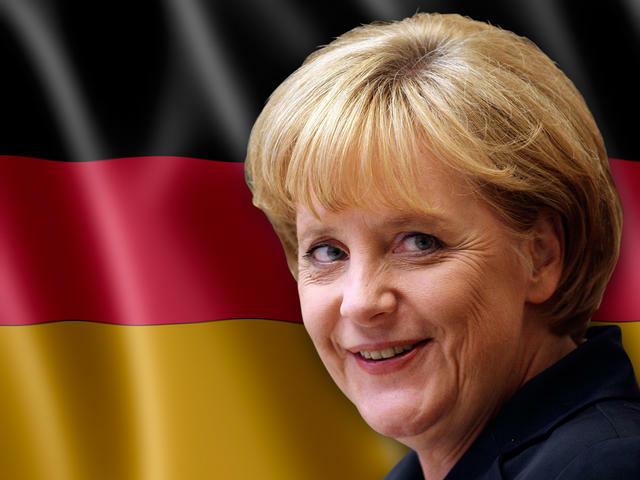 The impact has been much wider than Germany itself and continues to impact neighbouring states. Ironically, it may already have increased the likelihood of conflict within existing minority communities. A more controlled implementation, (which need not mean fewer people accepted) may allow the impact of a generous humanitarian policy to be more measured and less challenging for all concerned. What price a cup of tea? Some things have the capability to act as shorthand for a country, a kind of national image which everyone associates with a people or nationality. Often this is even the case when the object in question has very little to do with that country in terms of origin. One such example is the humble cup of tea. Few other things could immediately conjure up the British nation than it’s devotion to tea. 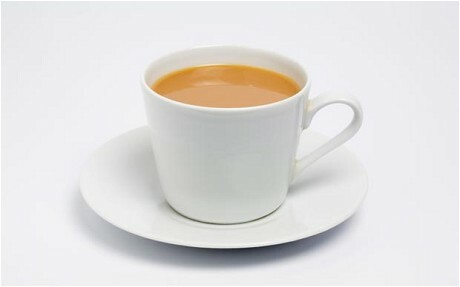 The best estimates suggest that over 60 billion cups of tea are made each year in the United Kingdom alone. Despite being only six major types of tea (white, yellow, green, oolong, black and post-fermented) these all come from the same species of tea bush, the difference is merely in the post picking preparation. The love affair with these steeped leaves started in the 1600’s with Portuguese traders bringing tea leaves back to Europe from China. Indeed some people say the British love of tea stems from decisions made in Tudor times when Elizabeth I granted the East India company a charter to operate. As that company grew, it established an infrastructure which ultimately supported the British Empire in India and lands capable of growing plants smuggled out of China. 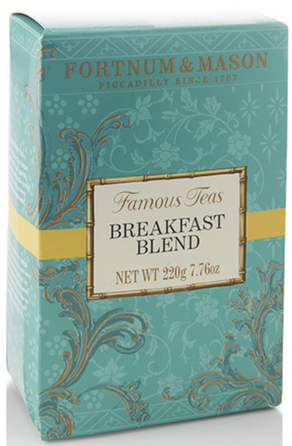 Whatever the reasons, it is clear that tea is now very big business in the United Kingdom. The exact figures are hard to establish accurately, however, there is little doubt that tea production and sale in Britain is an industry generating in excess of £1 billion pound annually. Although originally a Chinese specialist plant, the majority of the world tea production is now concentrated in the sub-continent of India. Assam and Darjeeling being the best known areas. The Indian government recognising the importance of a stable and readily available workforce placed requirements on tea plantation owners to provide adequate homes for their workforce. A move which at the time of its introduction made the more reputable plantations attractive employment options. However, things have deteriorated over recent years with homes in many estates now being little more than shacks. 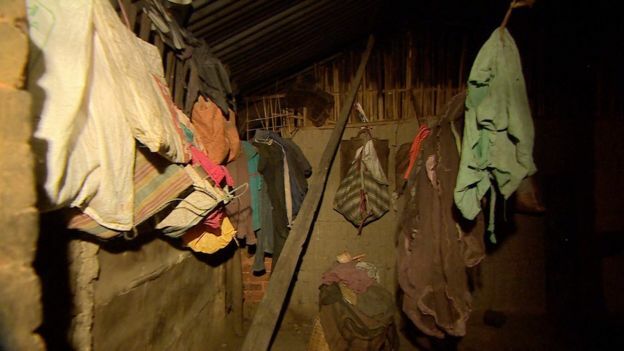 Many have virtually no roofs and the original concept of a house per worker has been rapidly moved to multiple occupancy often with as many as eight families sharing one small hut. de-facto levy to the provision of housing. They claim these requirements provide above average living standards for their staff which means their base salaries can remain low – and by that I mean typically £1 per day. So is there an issue with the sale of tea from these estates? Is the product over-priced or hard to sell? These conditions exist in plantations selling to Tetley, Yorkshire Tea, Twinings and Fortnum and Masons to name but a few. Hardly the cheaper end of the retail market and far from small purchasers. As an example an experienced tea worker can pick up to three bags of tea leaves during their shift for a day. Once processed these can make a pallet of tea, roughly 500 packets of loose tea such as the one shown here. In this example, just one of those five hundred packets within that pallet sells for £7.50. 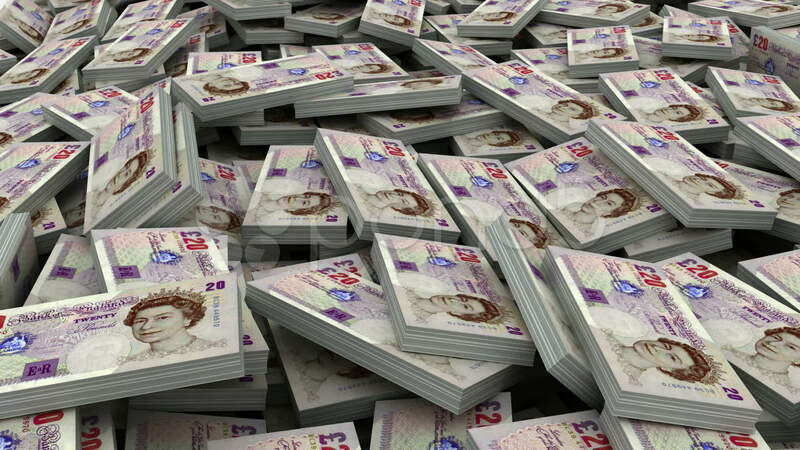 Put another way, just one packet equates to nearly a weeks wages for the average tea picker. Someone somewhere is making a very nice living, but it certainly isn’t those picking the leaves to provide your breakfast cuppa. Regulation and legislation does exist in India to address these conditions. However, the simple truth is that they appear to be totally ineffective. So what are our famous name purchasers doing with their undoubted buying power to improve the situation? The answer appears to be washing their hands of the problem. It appears to be the majority view that this is an internal matter for India to resolve. So next time you pay for your branded tea and wonder why fair trade tea might be more expensive this could well be one reason for the increased prices. However, reliance on fair trade isn’t sufficient in my view. Come on big brands, make a stand and refuse to accept working conditions that would have been more at home in the worst of the Dickensian novels. Food for thought when you next put the kettle on for you cup of English breakfast.